Mr and Ms’s Misiu preparing for the Suitsupply MTM program. 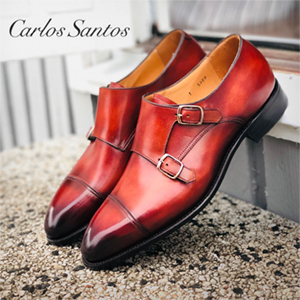 When a man starts to care about his style and understands the need for quality and fit, he will move from Ready-To-Wear (RTW) to Made-To-Measure (MTM). It is an increasingly popular term that has tried to bridge the gap between bespoke and RTW clothes. In Stockholm where I live one the most popular MTM experiences comes from Brothers. This is about to change since Suitsupply has just opened their brand new store in Stockholm. Along with them comes their world famous Suitsupply MTM program and I am here to tell you all about it. 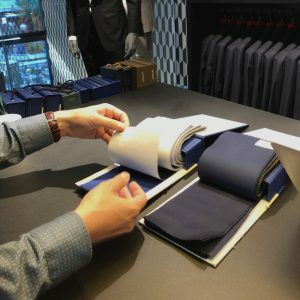 In part 1 of my review of the Suitsupply MTM Program I will tell you about my own personal experience and the process to create my first custom double-breasted navy suit. I will publish Part 2 in August when I receive the final product and can make a verdict. This post contains advertisements through ad-links for Brothers Sverige. 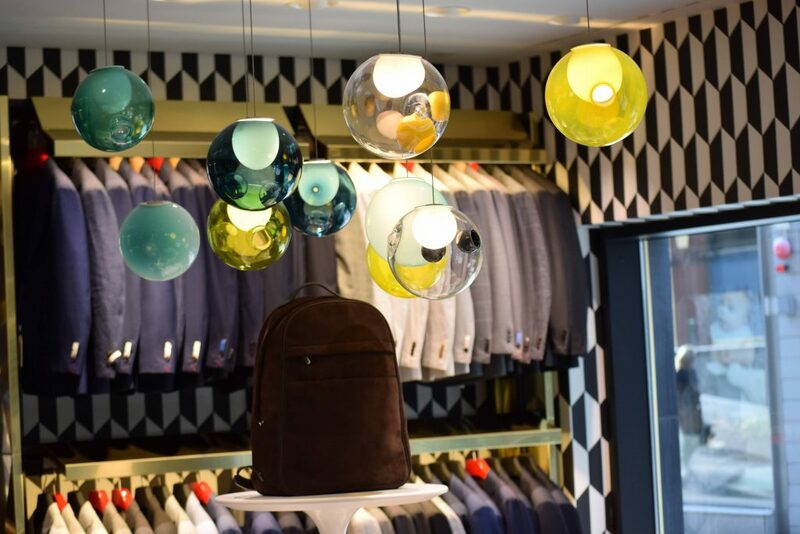 Fokke de Jong is the creator of Suitsupply in Amsterdam. Since its foundation in 2000 the brand grew with remarkable speed and it was a matter of time before expansion in Scandinavia. The store in Stockholm was planned for a long time and finally opened its doors in the Mood Boutique in Norrlandsgatan 13. The first thing someone will notice is how large the store is. In fact, it is 890 square meters! You can enter the store from 3 different entrances and each one has its own charm. There is a blend of modern and classic but the philosophy has definitely shifted to a more relaxed but serious environment. Suitsupply’s store is playful and serious at the same time. There is a very large collection of RTW items ranging from ties to shoes, suits and shirts or accessories. The staff is buzzing around constantly. They are friendly and helpful and you will feel like you want to spend more time there. I really liked entering for the first time through the back and seeing people sewing in their own workbenches. There are 3 choices when it comes to tailoring in Suitsupply. • In-Store Tailoring: Includes alterations to Shirts, Pants and Blazers. Prices range from 70 to 705 SEK. 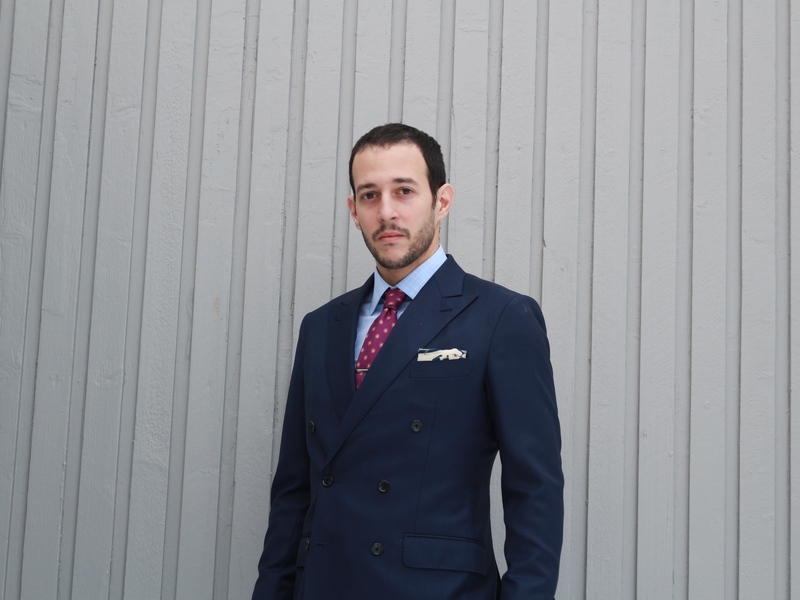 • Custom Made (Blue Line Personal Tailoring): The Suitsupply online service where you can order custom shirts and suits. There is a wide range of materials and patterns to choose from. Prices can vary depending on the choices you make. A typical 2-piece suit should cost you around 5000 SEK (≈560$ or 477€). 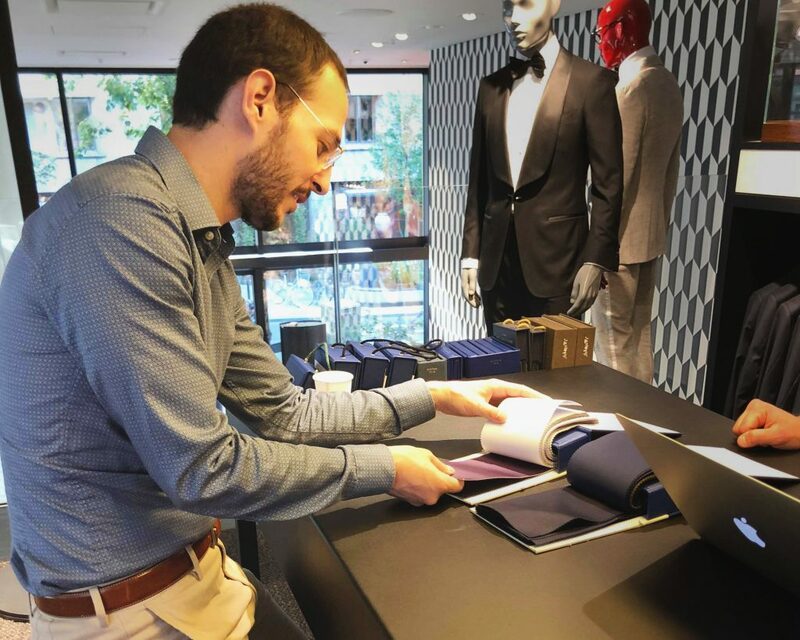 • Custom Made-To-Measure (Suit Up Personal Tailoring): The famous Suitsupply MTM Program will let you create your custom suit or shirt based on personal preferences. There are more than a 1000 different fabrics to choose from. This includes durable S110 wool up to S160 pure wool and countless optimisations. As soon as you enter the store the staff will greet you warmly and ask you what you are looking for. I was looking for the Suitsupply MTM Program so I was told the tailor will be with me shortly. You can book an adviser in minutes through the very user-friendly online form. I met Ted at 17:15 and we immediately got into business. We discussed what I wanted to make and worked our way up to every little detail. Here is how the process went. …and there is a very big selection of them. Initially I had to explain my choice. I was in the market for a good double-breasted navy suit in S110-S120 wool. I plan to wear this in business situations and quite often, so a more durable fabric is preferred. After discussing the fabric and style Ted brought me a test suit to put on and started taking measurements. My usual size is 46 for the pants and 48 for the suit jacket. 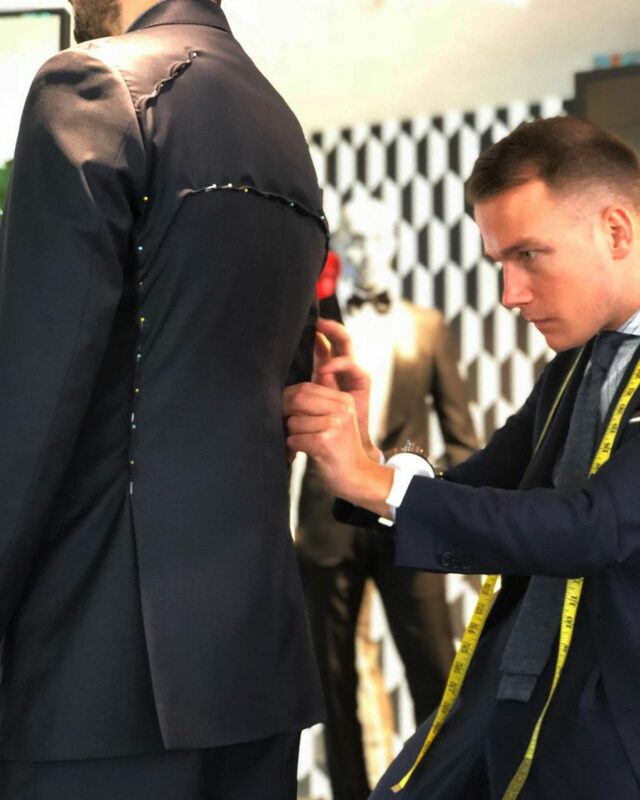 The Suitsupply MTM Program includes measurements and alterations in 40 different points. While measuring I was discussing with Ted about his journey in tailoring, the opening of the store and how important it is to have at least a half-canvassed suit. In Suitsupply there are no fused suits, which is phenomenal. This will be a very important piece for me and I went for a full canvas double-breasted suit in navy blue. The measurements process lasted approximately 30 minutes and the second part involved choosing the details of the suit. Picking the details gives character to your suit. It was fascinating to hear about Ted’s training and the passion behind everything. He was very professional and qualified and helped me make some choices that I have not had sufficient experience with. The whole staff underwent training for many months before the store’s grand opening. The final part of the visit was also important. You get to hear that your order has been placed and that it will take approximately 4-6 weeks for delivery. You will then receive a personal phone call and book a meeting for the second fitting. I expect Ted’s call around 1 of August. This means that my statement piece will be ready in time for my favourite event of the year: the World Water Week in Stockholm. Pricing for a 2-piece suit in the Suitsupply MTM program can start from 5899 SEK (660$ or 563€). Honestly that is a very reasonable price given that you can buy a branded suit for double the price and it has fused lining. There is nothing you can find at that price that is full canvas at least in Sweden. Do not forget about the cost-per-use that we discussed in the previous article. A quality item will most likely cost more but will last for years with proper care. A full canvas suit out of S110 wool will cost you about 6400 SEK (715$ or 610€) and if you opt for a more delicate S130 wool the cost goes up to 6900 SEK (770$ or 660€). A vest will set you back another 1700 SEK (190$ or 162€) and if you want hand-sewn buttonholes it costs about 350 SEK (39$ or 34€). Worrying about the cost? You have the option to make a 50% down-payment. When you are satisfied with your suit you can pay the other 50%! This helps cut the cost substantially. The ball is in your park prospective David Beckham! Can You Give Your Verdict Misiu Academy? 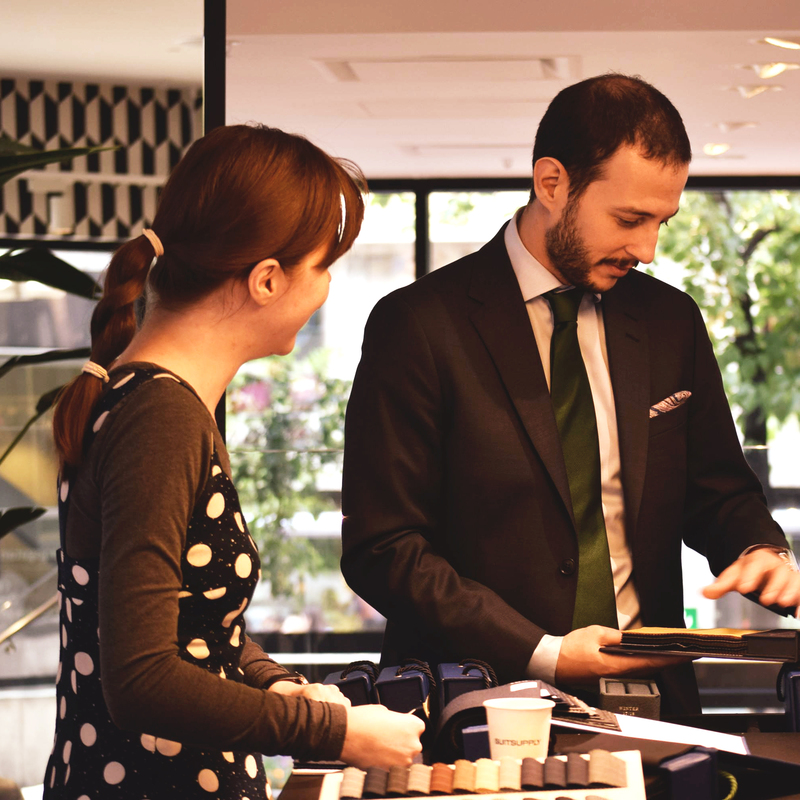 Service and Staff: Very welcoming, smiling and they will offer you a cup of coffee, tea or a glass of water. Tailor: Ted is professional and will answer all of your questions in detail. Knowledge: Everybody you will interact with is very well educated. Ted and Ludwig are exceptional and experts in their field. Delivery Time: You will receive your product in approximately 6 weeks. Dust off those dressy oxfords and go in that fancy gala you always wanted. Facilities: You are in for a treat. Modern, big and with a very broad selection of items. Maybe a bit too flashy and bright at some points, but it is not why you are there right? Come On, There Must Be Something Wrong! 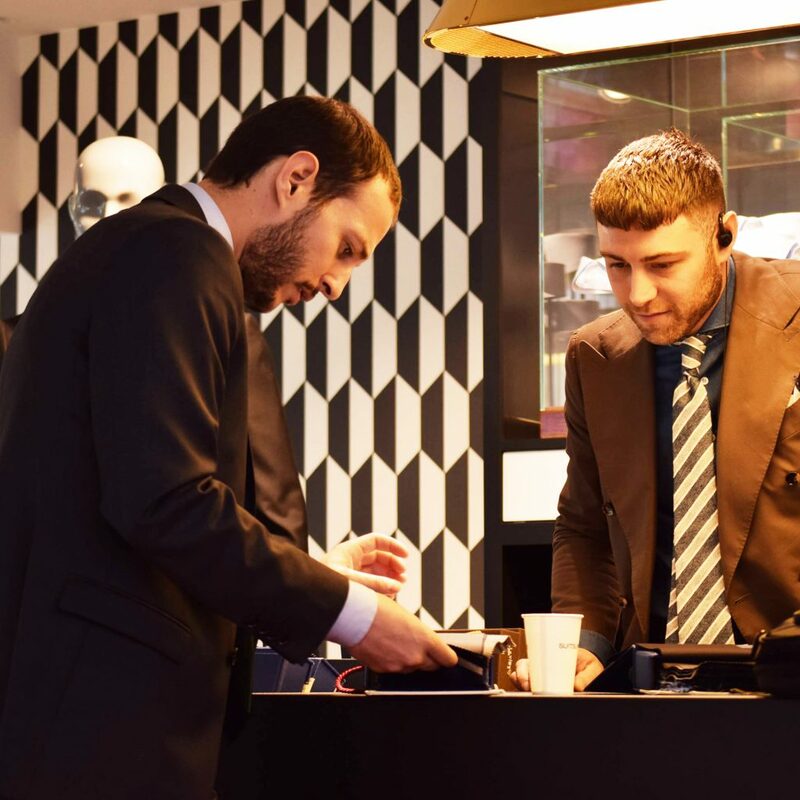 You will be very impressed with Suitsupply’s new store in Stockholm and the Suitsupply MTM Program. From the moment you walk in you will know that something special is happening in the heart of Stockholm. It is the biggest store they have in Europe and the frontrunners to the new style and design that the company wants to showcase in the future. You will feel the excitement to see the end product and feel special when a qualified tailor is taking your measurements in front of a mirror. Not everything is perfect though and the enemy of good is better. Ms’s Misiu Academy works professionally with light and brought up a very good point. In the room where all the magic is done there is a big yellow lamp shining over the showcase table. When you put the different fabrics during your choice on the table, the light reflects on them and puts a yellow tint. This brightens the fabrics up and it makes it harder to get a good visual representation in an everyday scenario. Keep that in mind when you look at the hundreds of fabrics available! Light can make a big difference. Just in case you are wondering: I am in no way affiliated with Suitsupply and this is my personal experience. Update: Check out Part 2 of the review here! Have you been in Suitsupply? Please share your experience in the comments section down below. Stay tuned for next week’s article and if you enjoy the content and the writing style please subscribe on the email list or share the article to someone that might benefit from it. Were you able to choose lapel width? On the double breasted options if I remember correctly they offer only peak lapels and not notch lapels. They did mention though that the peak ones are slightly less wide than usual but it is not really noticeable!